WASHINGTON — U.S. allies seeking to avoid the steel and aluminum tariffs approved by President Donald Trump might be asked to step up their financial commitments to NATO. Treasury Secretary Steve Mnuchin told CNBC in a Friday interview that the president will consider national security, noting that Trump wants to be sure that NATO gets more funding from European allies who Trump has previously criticized for not contributing enough. How much do NATO member nations spend on defense? President Trump has long sought to get NATO allies to spend at least 2 percent of their GDP on defense expenditures. “If we’re in NATO, he wants to make sure that NATO gets more money so that NATO can protect all of us and fulfill its goal,” Mnuchin said, underscoring Trump’s push to get NATO allies to pay 2 percent on defense. Trump drew on rarely used national security grounds to place a 25 percent tax on steel imports and 10 percent tax on imported aluminum. Only Canada and Mexico — both partners in the North American Free Trade Agreement being renegotiated — were excluded from the tariffs. Other countries seeking exemptions from the tariffs will have to make their case through U.S. Trade Representative Robert Lighthizer, but the president will make the ultimate decision, a senior administration official told reporters Thursday. Specific steel and aluminum products could also be excluded and that authority will rest with Commerce Secretary Wilbur Ross. Lighthizer was expected to be in Brussels this weekend for meetings with European and Japanese trade officials. The EU has warned that it could retaliate with tariffs on U.S. steel, agricultural and other products, such as peanut butter, cranberries and orange juice. Seven Senate Republicans are telling President Trump his aluminum and steel tariffs will endanger national security. Trump suggested before he signed the orders imposing the tariffs that Australia and “other countries” could also be exempted. He discussed the tariffs by telephone on Friday with Prime Minister Malcolm Turnbull of Australia and President Mauricio Macri of Argentina, the White House said. P. Welles Orr, senior trade adviser at the law firm Miller & Chevalier, said foreign governments are already asking how the exemption process will work. Philip Levy, a former trade adviser in President George W. Bush’s administration, said the flaw in Trump basing his tariffs on national security was that military allies could ask to be excluded, undermining the president’s stated purpose of protecting domestic steel and aluminum mill jobs. With national security as the primary issue, it would be hard to apply the tax to South Korea and Australia, meaning that they could ultimately land on Russia more than almost any other country, said Levy, now at adjunct professor at Northwestern University. 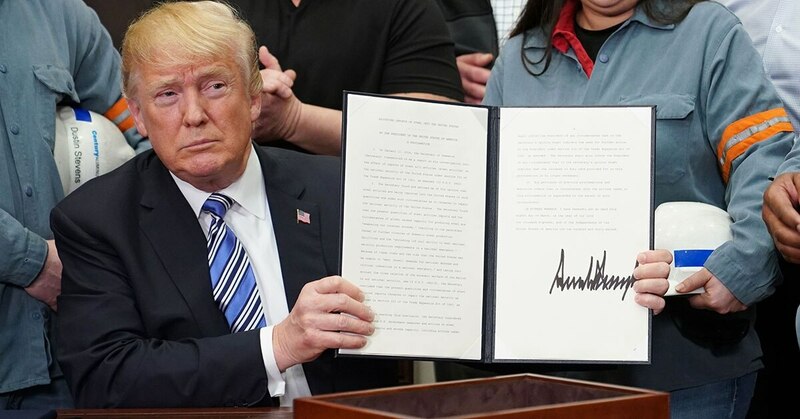 The proclamation signed by Trump ordering the tariffs do suggest some possible grounds for exemptions based off the specific reasons listed for excluding Canada and Mexico. Those two countries were excluded due to “shared” commitments on national security and the reduction of excess production of steel worldwide, a provision aimed mainly at state-backed Chinese companies that Trump blames for having flooded the world with cheap steel. The proclamation also notes how closely linked the United States, Canada and Mexico are, both economically and in terms of being physically next to each other. Sen. Ron Johnson, R-Wis., the chairman of the Senate oversight committee, launched a review of the president’s decision to impose the tariffs, asking Ross for a “detailed cost analysis” of the impact on the economy, how employment levels were factored into the decision and national security concerns.